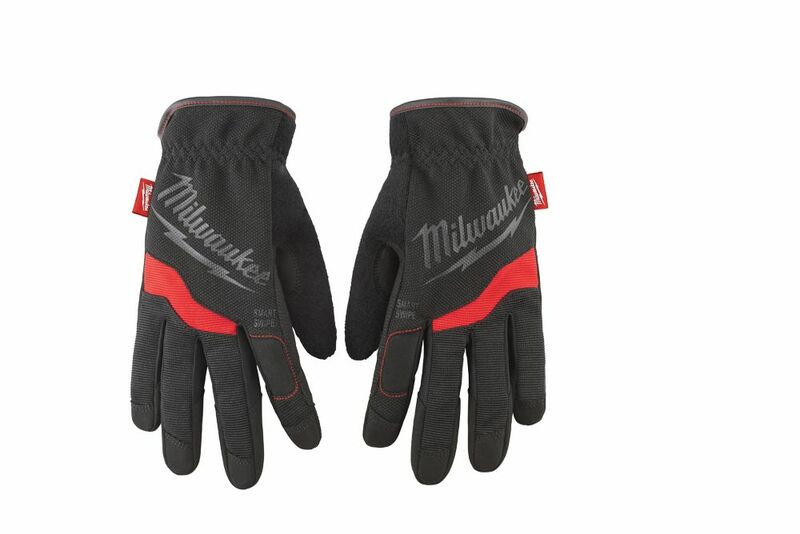 Milwaukee Free-Flex Work Gloves are designed to provide Ultimate Durability and All Day Comfort. Featuring Smartswipe fingertips, knuckles and palms designed to allow the use of touch screens, and high dexterity fingertips to provide precision when handling small objects. A reinforced thumb seam provides enhanced durability and the Free-Flex elastic cuff ensures the gloves remain comfortable enough to wear all day. Latex free and versatile for any job big or small. Touchscreen, High Visibility PU palms provide a no-slip grip. Nylon construction is design to be breathable enough for all day wear and with a snug fit means youll have natural movement and great dexterity. Leather palm provide protection and comfort. Rubberized safety cuffs protect wrists from cuts and abrasions. The cotton denim back is tough yet breathable. FreeFlex Work Medium Gloves Milwaukee Free-Flex Work Gloves are designed to provide Ultimate Durability and All Day Comfort. Featuring Smartswipe fingertips, knuckles and palms designed to allow the use of touch screens, and high dexterity fingertips to provide precision when handling small objects. A reinforced thumb seam provides enhanced durability and the Free-Flex elastic cuff ensures the gloves remain comfortable enough to wear all day. FreeFlex Work Medium Gloves is rated 4.9 out of 5 by 7. Rated 5 out of 5 by RLee from Very good quality gloves for general labor around the house or landscaping. There was a lightning... Very good quality gloves for general labor around the house or landscaping. There was a lightning deal for them creating a very reasonable price per pair so thought I'd try and stock up on extra gloves for future use. Couldn't be happier with them. Rated 4 out of 5 by Jbrid from Gloves worked fine for purpose. ... Gloves worked fine for purpose. Rated 5 out of 5 by Adam from Great for working with cars. ... Great for working with cars. Rated 5 out of 5 by Olivia from Just the right size. I have long nails but that wasn't a problem. Just the right size. I have long nails but that wasn't a problem.